Scribner Book Company, 9781451647860, 308pp. This is the untold story of living legend Mavis Staples--lead singer of the Staple Singers and a major figure in the music that shaped the civil rights era. One of the most enduring artists of popular music, Mavis and her talented family fused gospel, soul, folk, and rock to transcend racism and oppression through song. Honing her prodigious talent on the Southern gospel circuit of the 1950s, Mavis and the Staple Singers went on to sell more than 30 million records, with message-oriented soul music that became a soundtrack to the civil rights movement--inspiring Martin Luther King, Jr. himself. Critically acclaimed biographer and Chicago Tribune music critic Greg Kot cuts to the heart of Mavis Staples's music, revealing the intimate stories of her sixty-year career. From her love affair with Bob Dylan, to her creative collaborations with Prince, to her recent revival alongside Wilco's Jeff Tweedy, this definitive account shows Mavis as you've never seen her before. 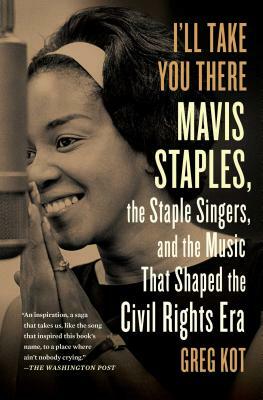 I'll Take You There was written with the complete cooperation of Mavis and her family. Readers will also hear from Prince, Bonnie Raitt, David Byrne, and many others whose lives have been influenced by Mavis's talent. Filled with never-before-told stories, this fascinating biography illuminates a legendary singer and group during a historic period of change in America. "Ultimately, Kot depicts the endurance of Mavis Staples and her family's music as an inspiration, a saga that takes us, like the song that inspired this book's name, to a place where ain't nobody crying" (The Washington Post).